Two reasons why Martin Luther King Jr. was able to change the world. First, King did not suggest that equality among the races be relegated to a future hope while the status quo of the day should be submitted to. As Christians we believe that upon the return of Jesus Christ the Kingdom of God will come in its fullness and God will right every wrong. Second, King practiced non-violence, even when it quite literally hurt him. Jesus Christ taught that we are to love our enemies, to forgive others, to love our neighbor as ourselves. Even as He was being crucified by His enemies, he did not retaliate but prayed for their forgiveness. In addition to this, Jesus taught a “third way” to address the wrongs in the world that we should seek to change. When faced with the evils of this world, a false dichotomy exists in terms of what our response can be. The options are often presented as either some sort of coercive or violent revolution where blood is spilled for the greater good, or non-violent passive acceptance of the way things are. Jesus engaged the political and spiritual powers of His day, but at the same time refused to go the way of violent insurrection against Rome. Jesus taught non-violent active resistance. Injustices are addressed, but violence is not used. I fear that Jesus teachings in regards to violence, like so many of His teachings, are simply not followed or only followed when it is convenient to do so. Many Christians, who claim to have the Spirit of God inside of them, claim that it is simply too hard to be non-violent, or will cost them too much. Others suggest that Jesus teachings are really to highlight how imperfect we are and how much we need grace. The practical implications of this is that people live their lives however they want and thank Jesus for their salvation and grace. Jesus teachings are widely ignored and not surprisingly we live exactly like the rest of the world does. King, and other like him, refused to do this. 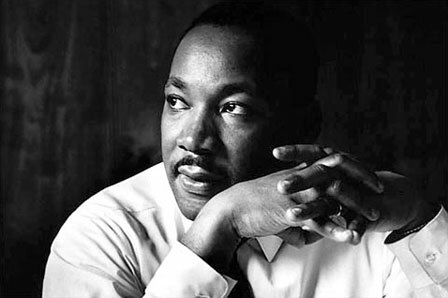 King took the teachings of Jesus regarding non-violence and justice seriously. He refused to lead a movement against white people but against injustice. He refused to say violence and coercion gets things done, and our enemies are using it, so should we. He refused to just thank Jesus for forgiving his sins as he went about an ordinary life, even an ordinary life as a pastor. Followers of Jesus, if you want to change the world, or your country, or your city, or your family, or your community of friends you do not have to be perfect, but you have to do at least two things: work towards our future hope now, do not let our future hope make you passive in the present, and obey all of Jesus’ teaching, even and especially when it goes against the way the world works. This entry was posted in Personal Commentary and tagged future hope, Martin Luther King Jr., non-violent active resistance, the way of the world.. Bookmark the permalink. 1 Response to Two reasons why Martin Luther King Jr. was able to change the world.